This is just a quick post to advise all our customers current and future, that we have been members with Checkatrade since January 2014. 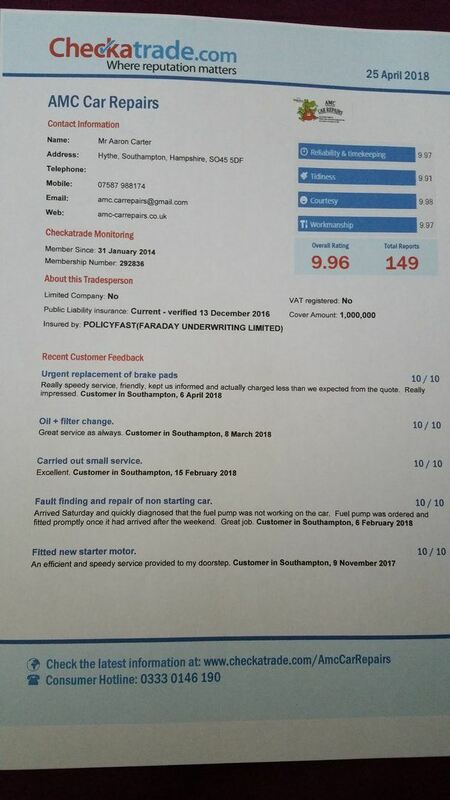 As of 1st May 2018 AMC Car Repairs will no longer be Checkatrade members. We have often shared with you valuable independent customer reviews, through the checkatrade site and have been very proud of the feedback we have received. However, we have made the decision to leave the Checkatrade scheme. This is due to the huge increase in their membership fees and the fact that a lot of the enquiries we were receiving through their site, were coming from customers who lived too far away for us to be able to help them. We want to keep the independent reviews on our website for customers to see and so felt it was only right that we informed you why we are no longer members with checkatrade. If the membership fees had not increased and the enquiries received been local, then we would have continued our membership with them, but we feel that the money we were spending can be put to better use elsewhere.